Greetings, thank you for this, it is a LIFESAVER application. I've found something interesting. 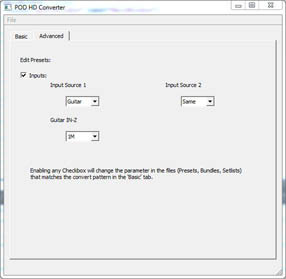 It seems that your converter is causing HD Pro Edit to display zeroed amp parameters, but the values are set correctly even though you can't see them. 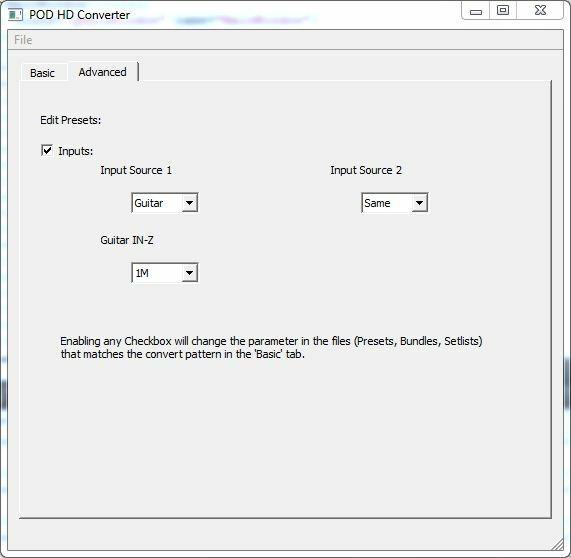 I downloaded http://line6.com/customtone/tone/208866, sent it through the HD500 -> HD Pro converter, opened the tone in HD Edit 2.21.0, and found that even though the tone sounded great, the amp parameters (master, sag, hum, bias, bias x) were all zeroed. I used my mouse to pull one of the amp masters from zero to 100%, then back to zero. As I did this, the tone became louder and more saturated until I hit 100%, and then less intense as I dialed it back to zero -- and when I hit zero the tone sounded completely wrong. Through trial and error I was able to determine that the author of the tone had the master set to ~50% when he saved and uploaded the tone. I loaded a brand new tone and brought in the Treadplate, which was one of the models used in the downloaded tone. The master was set to 50%. I pulled in the JCM 800 and it was the same. Were you aware of this before now? Is there a workaround? Thanks for your comment and your help! Maybe its the same thing i've stumpled over. I've made a post in the POD HD forums , and some time later also opened a bug report and i recorded this youtube video describing the bug as well. So, it only happens if you use the HD Edit Software in offline mode, meaning without a proper connected device for the right software. So, that makes the offline mode completely useless, because it does not restore the settings correctly. The support guy i've had talked to confirmed that the software needs a bidirectional connection to a device to read all settings, even if you only load a preset from the disk. 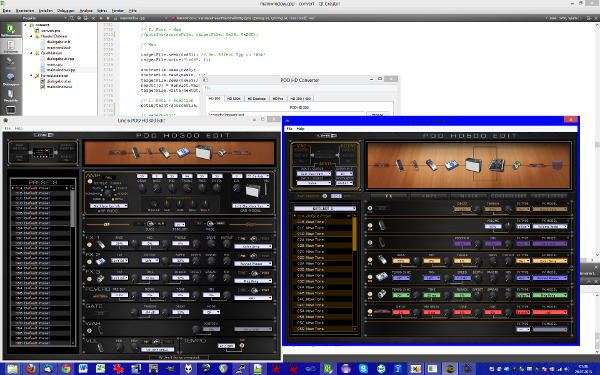 I think its the same thing since the program i wrote actually does not touch any amp settings for the converter mode, just if you translate an HD 500/Pro/Desktop to the HD 300/400, then it modifies almost everything. So, did you connect your device in advance?! can I use this to convert hd300 or 400 to hd500 patches? Actually, all the stuff is already in the program, someone just has to implement the reverse functions (HD 500 -> HD 300)..
You are obviously a talented programmer. Do you think you could create an android app of the hd500 edit? I have been trying but I cant even figure out what programming language it is in. It might be possible. From what i know, Markus Grabner reverse engineered the POD Xt and also has support for the POD HD Line. I mean, he has written an application that directly speaks with the device on Linux. That means he had to figure out what gets transfered over the USB cable. I only have knowledge about the presets. Someone still has to write an app for android. The "knowledge" might be there already, but that would still be lots of work "porting" this to android. I honestly don't even know if its really possible, since i don't know much about android, except that its java, but i don't know about usb apis/access and so on. The more "internal" stuff. I own an HD POD 500x and was trying to make sense of what's up here and the comments as well, but I'm still very lost. I want to downlaod patches from cutomtone that arent compatible to a 500x. Am I able to do this with your software? 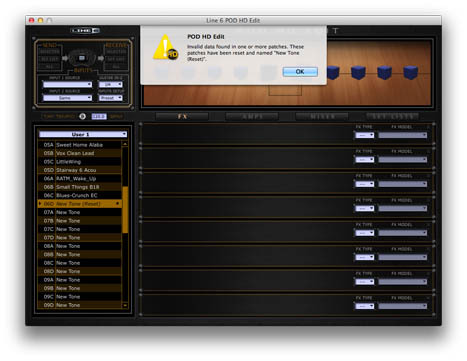 a line 6 helper referred me to this page from the line 6 community page. Hope you have time for a reply, thanks a lot. Let me know if you still didn't figure it out on your own and where exactly your problem is. 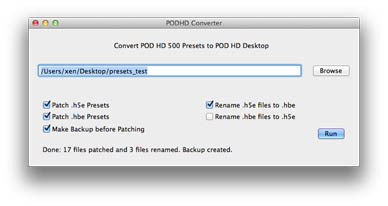 Hi...I have a Pod HD Desktop (Bean) and I've used your conversion utility to convert various 300/400/500 and Pod Pro patches to use on my HD Desktop. However it seems it doesn't work for 500x....are you aware of this or is it something I'm doing wrong? I haven't had any issues with any other types, only the 500x patches. No, i was not aware of it :). Maybe i didn't do enough testing, so i'll look into this within the next days. 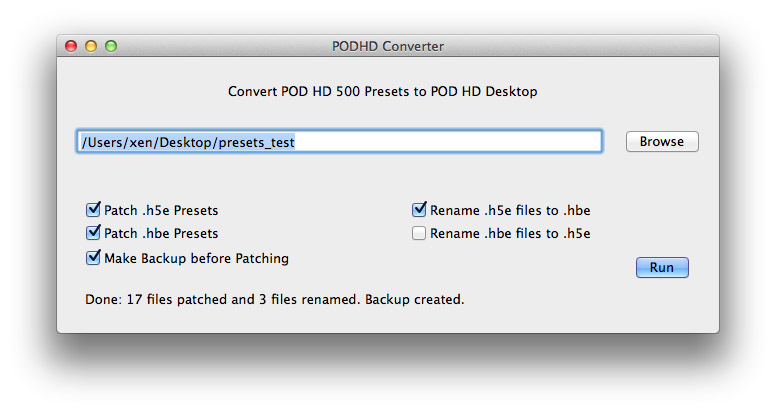 Just discovered that there is a new POD HD Pro X, then i can fix the 500 X and add support for the Pro X. Okay, i'm not sure if it's fixed now. 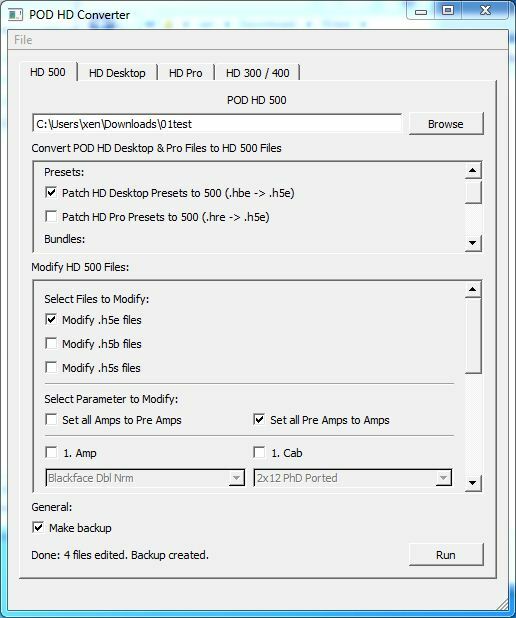 I misspelled in the rename function the extensions for the HD 500 X with the one for the HD 500. :( So now, you can successfully convert HD 500 X Presets to HD Desktop Bean Presets. Got it figured it out. When I was downloading from custom tone site, it was downloading with wrong extension. I tried re-downloading and this time manually instead the proper extension (.5xe) before saving the file. Once I did this and ran your program, conversion worked! Thanks! I'm running your programme and looking to batch convert a setlist of full amp patches to preamp patches for the DT25. When I click on browse and open the directory containing setlist (and other patch) files, none are shown. Its says "No items match your search". I therefore can't perform the operation. Just choose the directory that contains the setlists and press okay, regardless of what is written in the Chooser-Dialog. It's okay if nothing is shown there, because i didn't set any file filters. The path of the directory should be listed in the box next to the Choose-Button, then simply hit run it should work. Otherwise please tell me a bit more about the setlists you try to convert from what device to which device? If anybody needs this to run on a mac, download the Wine Bottler from http://winebottler.kronenberg.org. It will wrap the windows program up with wine and then the program runs fine on OS X.
I love you, thank you so much for sharing this simply but great program, you have made my christmas! There should be a link to your page at customtone and you should get benefit from this, even money isn't everything in this world! But thx again that there are people like you sharing and caring and not thinking about money!!! I quess that one guy couldn't rename .l6t to right extension so he instantly started complaining but don't care about his negative approach, he was wrong! Merry Christmas to you and very good New Year!!! I've just downloaded your app but I've got a problem. When I run the app I get more than one "out" and all different! Sorry it took so long and thanks for remembering me! Support for POD HD ProX is on its way. It's good to see this software is still alive! Thanks a million, great program! Hi Jzab, sorry to bother you but the last link seems not to work ... can't download ! Thanks so much for providing this program! 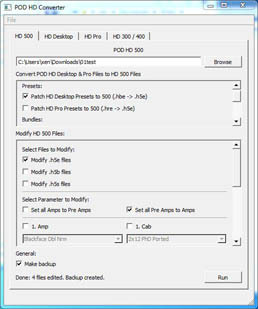 when I convert hd5 to hd4 it show about 6 or so files from the conversion of one...why is it doing that? You sir have saved hours and hours of programming for our studio/bands as we use the PODs everywhere. An enormously BIG THANK YOU for your magic! Works as advertised, 11.02.2015. Thank you for this! ... for your excellent work and sharing it for free! 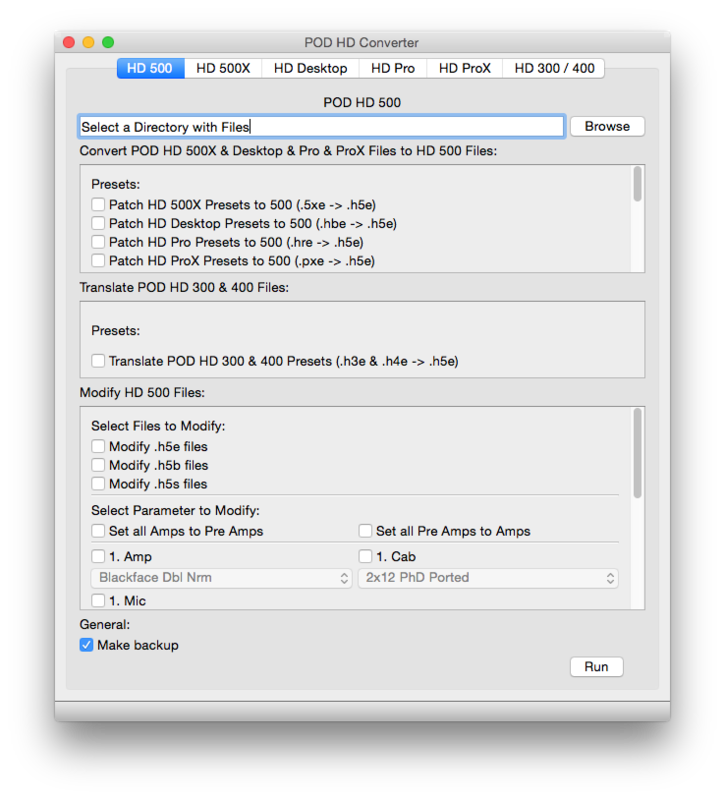 The application works very well in the latest version of OS X and I'm able to convert POD HD files back and forth without a problem. You're definitely racking up guitar karma points. Keep up the good work. I wasn't really sure if it would actually run under the current OS X version since it was the first time I've compiled software without using Xcode. Glad to hear it works,..
Do you have an idiots guide for the HD converter ? I've downloaded the application file but don't know what to do now. Bin gerade auf diese Software gekommen. Ich sage nur genial, genial, genial! Tausend Dank und einen schönen Gruß aus Haar! ciao, think i'm a stupid and i shame...but unfortunately i cannot even install your software. get a mesage like "it's not a valid 32 win app..."
This worked great!. Line 6 should be paying you commission.. I do everything but it doesn't work. The Browser of this good converter doesn't found my presets. I use windows10 64 bit version. Yes. It's a bit awkwardly programmed. You've to chose to directory that contains the presets. You'll not see the files in the browser because it isn't setup for selecting files but folders.